It's the attention to detail you get with JoomlArt that makes joining this club a no brainer. Just look at what they've released for April to see what I mean. This new theme comes packed with module positions, hilite options, typography and much much more. To top it all off it just looks good. If you join JoomlArt you not only get this theme but you get access to 29 others with another 24 over the next twelve months. 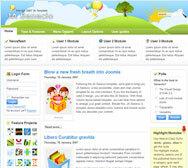 You can click here for more information, a demonstration or even to join JoomlArt.